il gusto del tonno viene esaltato da una sapiente combinazione di verdure e spezie per chi ama i sapori decisi. The taste of the tuna is enhanced by a skillful combination of vegetables and spices for those who like strong flavors. Italian cow's-milk cheese, typical of Lombardy, Piedmont, and Veneto. 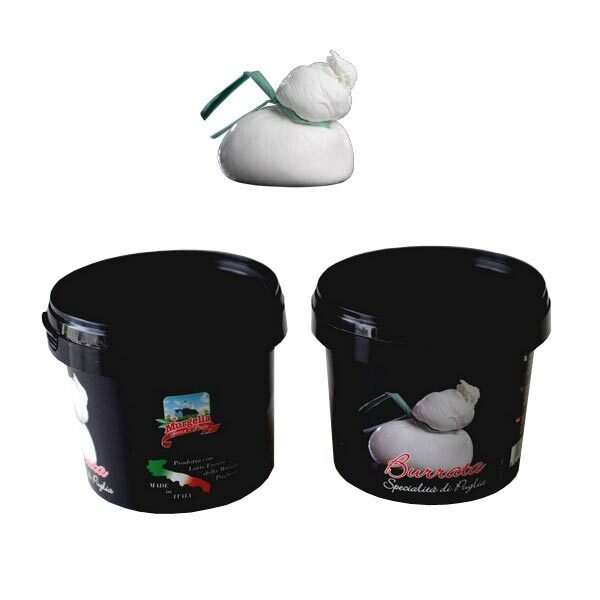 A fresh very creamy soft cheese made only with the best Italian cow milk cheese. 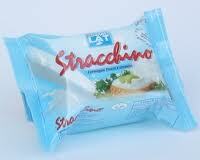 Stracchino is found commonly used as one of the fillings in Piadina, Italian flatbread which goes well with arugula (rocket) and parma ham. 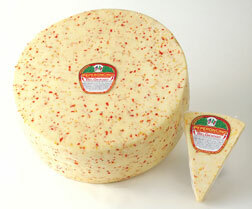 Similar to Pepato, this cheese contains small red peppers. 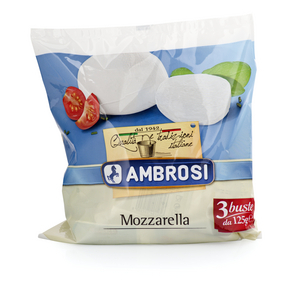 It blends the mellow Asiago flavor with the hot taste of red peppers. 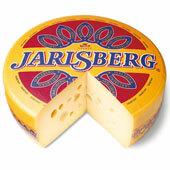 A zesty cheese which spices up salads and party trays. Great for hot or cold sandwiches. Aged a minimum of 5 months. Caciocavallo comes from cow's milk and has a mild, slightly salty flavor and firm, smooth texture when young (about 2 months). 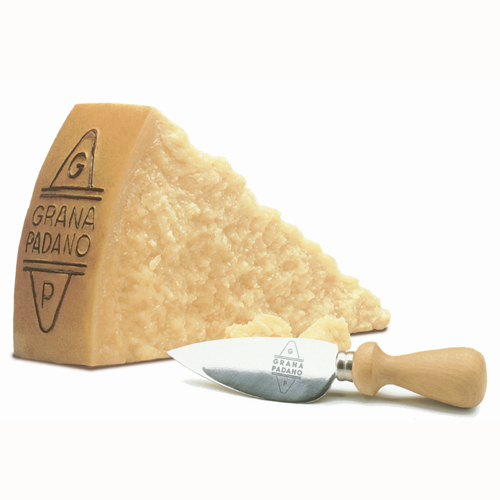 As it ages, the flavor becomes more pungent and the texture more granular, making it ideal for grating. 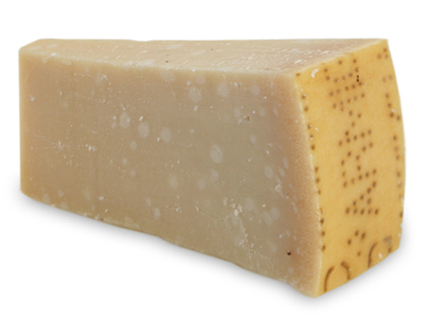 Caciocavallo is one of the pasta filata types of cheeses (Provolone and Mozzarella), which means it has been stretched and shaped by hand. A all shape weight approximately 6 pounds. Price per 1/4 pound. 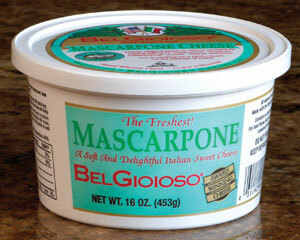 BelGioioso Mascarpone is a Kosher approved soft cheese with a light,slightly sweet and buttery flavor that is a compliment to any dessert. A necessity for decadent Tiramisu! Imported from Italy, Italian Burrata. 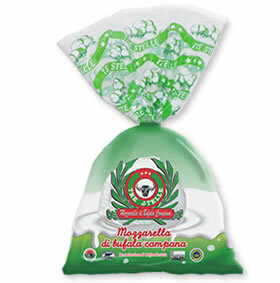 Mozzarella di Bufala Campana 100% D.O.P. Italian D.O.P. 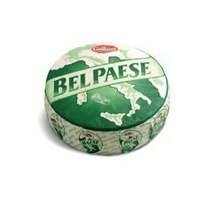 pasta filata cheese, obtained from pasteurized buffalo milk. A superior, 18-month aged Grana Padano produced by Agriform near Venice. This masterpiece compares beautifully with its better-known cousin Parmigiano Reggiano. A fairly salty, hard cheese. One of the reasons that Stella cheeses are so popular is that there is little-to-no variation between wheels. Stella aged asiago is the same in December as it is in June. This cheese has a slightly sweeter, smoother and nuttier taste than Parmesan. 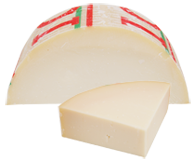 Stella aged Asiago cheese is sharp with a robust flavor. 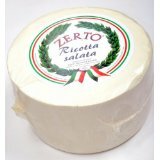 Ricotta Salata, this is an Italian cheese made from 100% sheep's milk. Characteristic of Southern Italy, it is enjoyable for cooking, salads or on its own and is available in semi-soft form or hard, which is mostly used for grating. 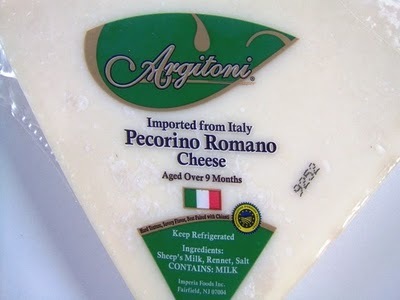 Argitoni Cello Genuine Pecorino Romano Cheese - Italian Sheeps Milk Cheese. 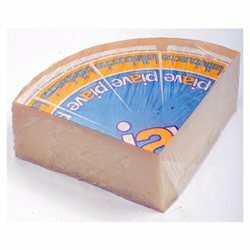 A mild nutty-flavored part-skim cow's milk cheese characterized by large holes. A savory, fatty, and moist boneless pork roast of Italian culinary tradition. 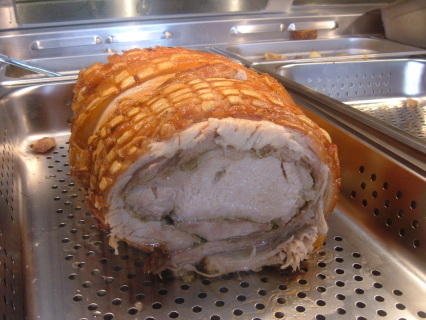 Cured in salt and various spice combination which may include garlic, bay leaves, juniper berries, nutmeg, and other spices, and then rested for a period of several weeks. After this the smoking process begins. Speck is cold-smoked slowly and intermittently for two or three hours a day for a period of roughly a week using woods such as beech at temperatures that never exceed 20°C (68°F). 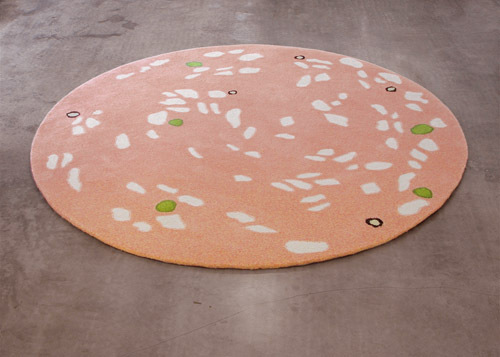 The speck is then matured for five months. 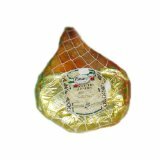 Loved by Italians, prosciutto cotto is Italy’s top-selling salume. Its gentle, yet mildly spicy aroma and soft-pick color are instantly alluring. Thanks to decades of experience, Parmacotto has mastered the delicate art of cooking ham. Originating in Bologna, a city known for its rich gastronomic tradition, Mortadella is comprised of finely ground select cuts of pork folded together with cubes of rich jowl fat and nutty pistachio slices. 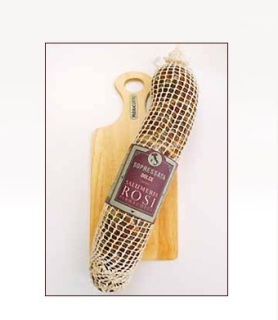 Bresaola is an air-dried cured and aged beef Salume, obtained from the most valuable cuts of the bovine thigh. Intense and uniform red color, tender and soft with delicate flavor and spiced aroma, Bresaola is lean and healthy. 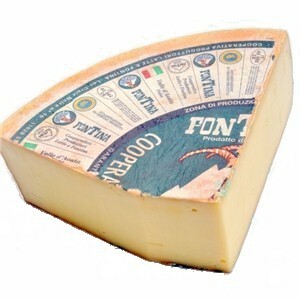 The Fiorucci Tradition of quality, and innovation started in Italy in the mid-1800's by Innocenzo Fiorucci in Norcia, Italy, with a dream of providing the finest quality foods to his community. Using long-cherished family recipes and with the help of old-world artisans, he produced what have become the best loved and number one selling deli meats in Italy. “Maestri Salumieri” (master chefs) blend fresh, lean meats with imported spices and Italian red wine, then ferment and carefully age each salami in traditional vaults. Imported from Italy. Aged for over 400 days. The elegantly fragrant and sweet flavor are unique to the climate of Parma, Italy and a tradition more than 2,000 years old. Only premium, hand selected and trimmed hams are chosen for Fiorucci Prosciutto. Sliced and packaged for you. 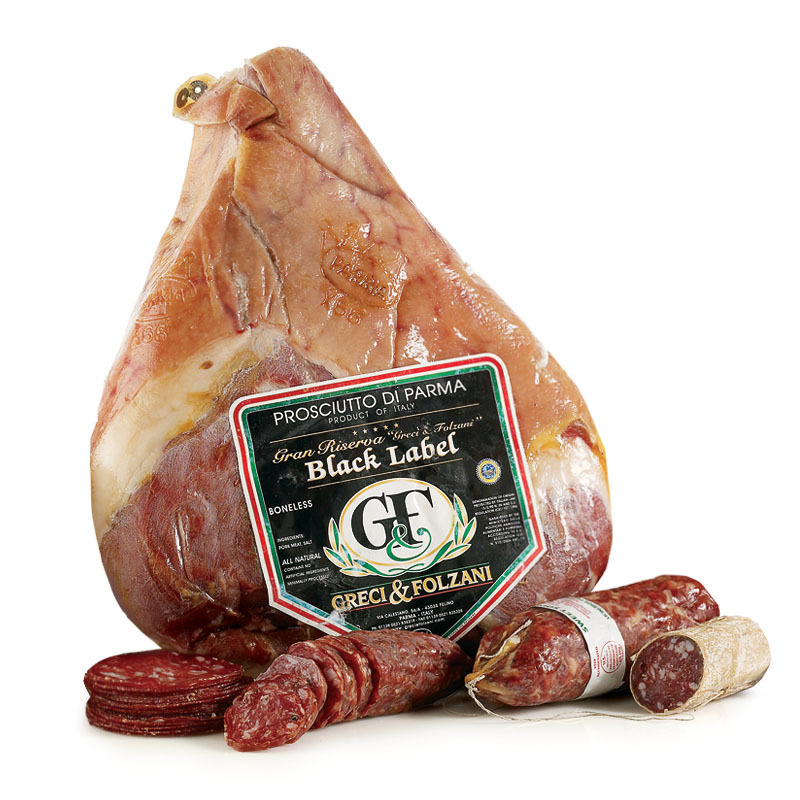 The most renowned dry-cured Italian ham, made with the best Italian pork legs, packed in a strictly defined region around Parma, Italy. Parma is a beautiful Italian city known for its monuments, castles, opera and haute cuisine! 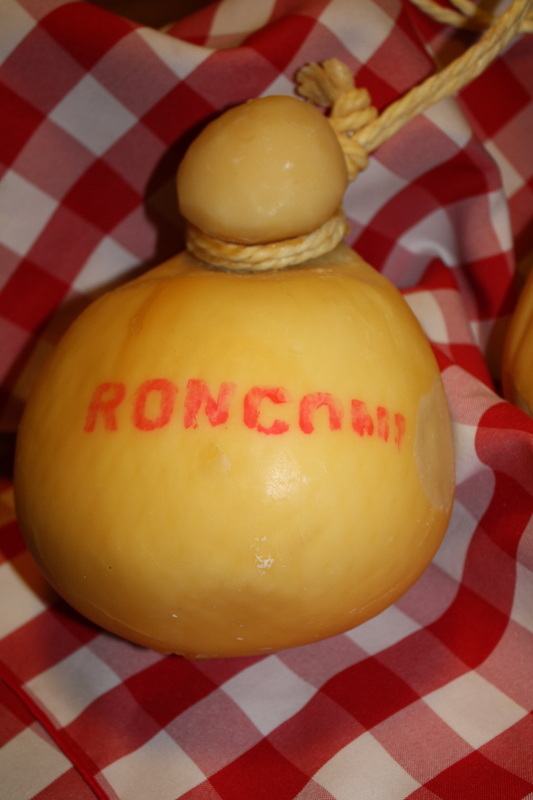 The oldest of the three Prosciuttos made by our producer Greci & Folzani in Parma Italy. Hand selected legs are aged for 24 months, bringing out the meats natural flavor, complete with hints of mixed nuts and a salty-sweet finish. Sopressata is a dry-cured, fermented sausage found throughout Italy. Made with prime cuts of pork shoulder, leg and belly Sopressata Dolce's avor is sweet with hints of seasonings, and black pepper. 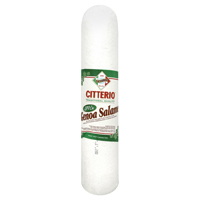 This salame is fantastic for slicing for panini or just for an antipasta platter. 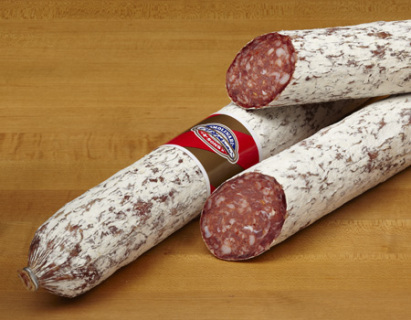 This large salame is made with Berkshire Pork. 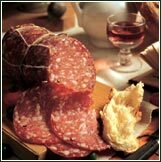 The meat is typically coarsely pressed, rather than ground (minced) as with salame. This gives it an uneven, "rustic" appearance when sliced. The sausage is hung up to dry for anywhere between 3 and 12 weeks, depending on the diameter, and loses about 30 percent of its original weight. 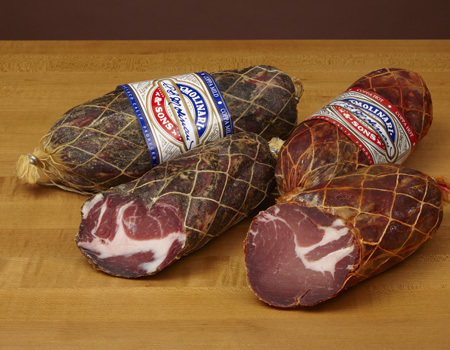 Napoli Salame is smoked over applewood with a hint of fennel giving it a complex, hearty flavor. 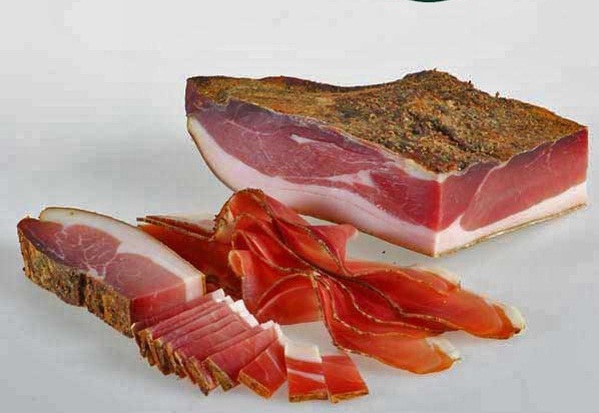 Dry-cured pork shoulder superbly seasoned; rivals Prosciutto in flavor. Hot or Mild. MOLINARI Pancetta is an authentic Italian-style bacon. 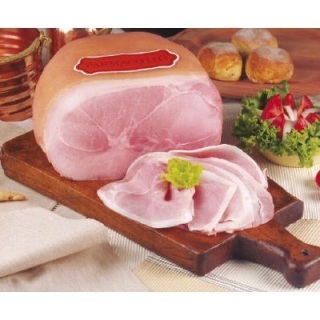 Extra lean, it is seasoned, cured and rolled tightly into a loaf and wrapped. 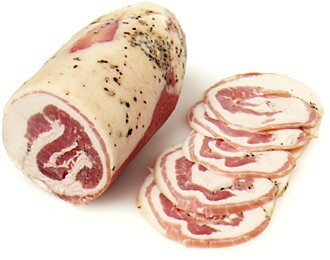 Made from pork’s belly, Pancetta, or “little belly” is cured with salt and spices and air dried. Not smoked, it is moist and mellow and requires cooking, for a crisp crunch and sharply salty taste that adds richness to soups and stews. All pork, dry-cured salame with burgundy wine. 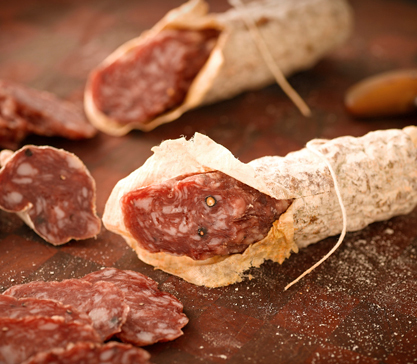 Aromatic spices from around the world are combined with a medium grind of choice cuts of pork and beef to give Citterio's Genoa salami a distinct flavor and richness. 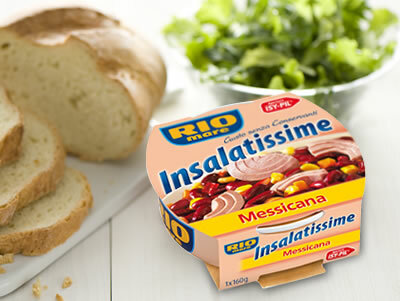 An ideal salami for sandwiches, antipasto platters, chef's salads or as a flavorful topping on pizza.